Jane Russell, a movie star in the best sense of the word, passed away today in Santa Maria, California, with her family at her side. Jane was, quite simply, a great gal. Whether she was drawing laughs opposite Bob Hope in THE PALEFACE (1948) and SON OF PALEFACE (1952), sparring with her lifelong close friend Robert Mitchum in HIS KIND OF WOMAN (1951) and MACAO (1952), or trading wisecracks and singing with Marilyn Monroe in GENTLEMEN PREFER BLONDES (1953), Russell lit up the screen, adding fun to any movie in which she appeared. Most recently I enjoyed her playing herself, entertaining at an army camp in a flashback sequence in FATE IS THE HUNTER (1964). I also admired the way Russell lived her life off the screen. She was forthright about her Christian faith and equally frank about her pro-life views. Unable to have children due to an abortion as a young woman, she adopted three children and founded World Adoption International Fund (WAIF), which helped thousands of children around the world find homes. In 1985 Russell published an autobiography, MY PATH AND MY DETOURS. There's also an excellent chapter on Russell in KILLER TOMATOES, by Laura Wagner and Ray Hagen. Obituaries have been published by the Los Angeles Times, Hollywood Reporter, CNN, and the Santa Maria Times. Blogs paying tribute include Out of the Past, The Self-Styled Siren, 50 Westerns from the 50s, and Leonard Maltin's Movie Crazy. I'm sure there will be many more Russell posts to come. Services will be held March 12th at Pacific Christian Church in Santa Maria. Thanks for the memories, Jane. 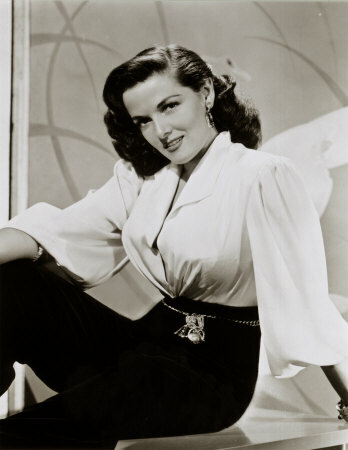 March 1st Update: Here's the TCM Remembers tribute video montage for Jane Russell. TCM just released their June schedule -- more on that later -- and by chance there was an 8-film birthday tribute planned for Russell on June 21st. It's time to take a look at Turner Classic Movies in March! The 31 Days of Oscar festival wraps up on March 3rd; suggestions for the first three days of the month were included in last month's post. ...The March schedule begins in earnest with a seven-film tribute to John Garfield on March 4th. It's a day filled with outstanding titles. Later that evening, THE RICHEST GIRL IN THE WORLD (1934) is a cute romantic comedy with Joel McCrea, Miriam Hopkins, Fay Wray, and Reginald Denny. It was remade a decade later as BRIDE BY MISTAKE (1944). 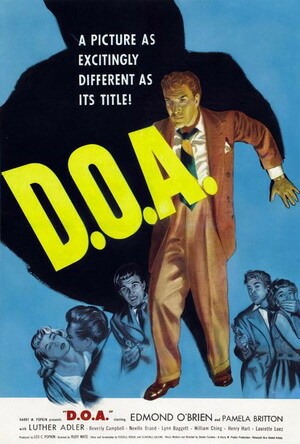 ...If my Film Noir Blogathon post on D.O.A. (1950) intrigued you, you're in luck, as it's being shown on March 5th. ...March 7th is a day of swashbucklers, including the marvelous SCARAMOUCHE (1952), which is a family favorite. 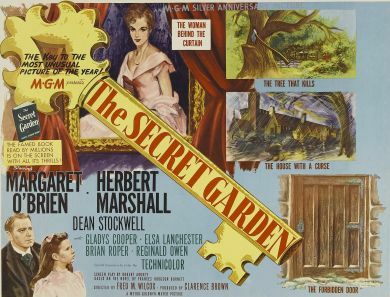 It stars Stewart Granger, Eleanor Parker, Janet Leigh, and Mel Ferrer. Later that night, it's time for the perennial "spooky house" favorite, THE UNINVITED (1944), starring Ray Milland and Gail Russell. I strongly encourage recording these titles if you haven't caught up with them yet. ...There's a seven-film tribute to the late Claire Trevor on March 8th. I had a good time watching THE DESPERADOES (1943), in which she costarred with Randolph Scott, Glenn Ford, and Evelyn Keyes. As I shared in this post, the Oscar-winning Trevor was also known for her philanthropic work here in Orange County, including funding the Claire Trevor School of the Arts at the University of California, Irvine. ...I've read quite a bit about the pre-Code SYMPHONY OF SIX MILLION (1932), which stars Ricardo Cortez and Irene Dunne. I'm looking forward to recording it on March 10th. Later that date TCM is showing SHE MARRIED HER BOSS (1935), a fun film with Claudette Colbert and Melvyn Douglas. ...THE MATING OF MILLIE (1948) was a favorite of mine to catch on TV when I was growing up, and now one of my daughters loves it too. It's a very cute film with Evelyn Keyes and Glenn Ford, who worked regularly together throughout the '40s. It will be shown on March 11th. ...March 12th just might be the best day on the schedule. It starts in the wee hours with the Powell and Pressburger film A CANTERBURY TALE (1944)...continues later in the day with one of my favorite movies, John Ford's WAGON MASTER (1950)...that afternoon there's one of the greatest Westerns of them all, RIO BRAVO (1959)...and that evening is the classic musical LOVE ME TONIGHT (1932), with a dazzling Rodgers and Hart score, innovative filming (don't miss the opening "Isn't it Romantic?" 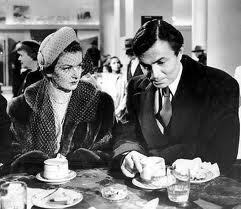 sequence), and a delicious comedic performance by Myrna Loy. ...Those of us who appreciate the underrated George Brent can enjoy a nine-film Brent festival on his birthday, March 15th. I'm especially looking forward to THE RICH ARE ALWAYS WITH US (1932), costarring Bette Davis and his one-time wife, Ruth Chatterton. 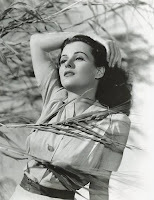 SOUTH OF SUEZ (1940) with Brenda Marshall is also on my "must see" list. The day's films also include SO BIG (1932) with Barbara Stanwyck and Bette Davis, WEEK-END MARRIAGE (1932) with Loretta Young, and one of my favorite pre-Codes, THEY CALL IT SIN (1932), also starring Loretta Young. 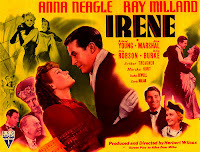 ...St. Patrick's Day will be celebrated on TCM in fine style, with a line up which includes Anna Neagle and Ray Milland in the charming IRENE (1940), June Haver and Gordon MacRae in THE DAUGHTER OF ROSIE O'GRADY (1950), Dennis Morgan and Arlene Dahl in MY WILD IRISH ROSE (1947), Morgan and Priscilla Lane in THREE CHEERS FOR THE IRISH (1940), Rod Taylor in YOUNG CASSIDY (1965), and Fred Astaire in FINIAN'S RAINBOW (1968). 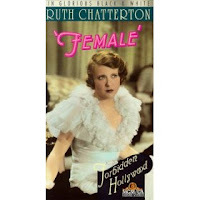 ...On the evening of the 17th, don't miss FEMALE (1933), one of the very best pre-Codes, which stars Ruth Chatterton and George Brent. It's delicious fun, worth watching for the set design alone (wait till you see the organ! ), and only an hour long. 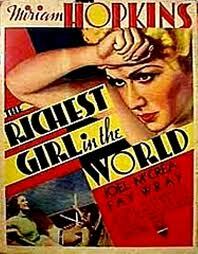 ...March 18th I'm very happy about BIOGRAPHY OF A BACHELOR GIRL (1935), a Robert Montgomery film I've never seen. It costars Ann Harding. ...On March 21st, don't miss Robert Ryan, James Mason, and Barbara Bel Geddes in the rarely shown Max Ophuls film CAUGHT (1949). It's available on Region 2 DVD and is part of Netflix's "Watch Instantly" lineup, but it's not out on DVD in the U.S. ...I really enjoyed RICH MAN, POOR GIRL (1938), a short and sweet romance starring Robert Young and Ruth Hussey, with Lana Turner and Lew Ayres as Hussey's relatives. It will be shown March 24th. 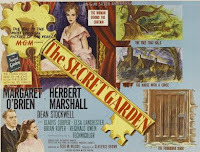 ...On March 27th the excellent Margaret O'Brien version of THE SECRET GARDEN (1949) will be shown. It costars Dean Stockwell as bratty Colin. Later that day there's a chance to see the delightful TAMMY AND THE BACHELOR (1957) with Leslie Nielsen and Debbie Reynolds. I still have warm feelings remembering Reynolds singing "Tammy" sitting on the window seat, a really lovely movie moment. ...Only on TCM will film fans find a birthday tribute to Warner Baxter! March 29th the nine-film tribute includes the very good ADAM HAD FOUR SONS (1941), with memorable performances by Ingrid Bergman, Fay Wray, Susan Hayward, and young June Lockhart. There's also a bunch of Baxter's CRIME DOCTOR movies. 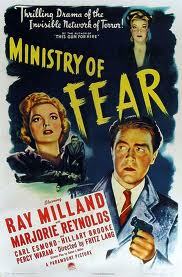 ...On the 30th there's an opportunity to see MINISTRY OF FEAR (1944), a Fritz Lang thriller starring Ray Milland. Later that night, the Lubitsch gem TROUBLE IN PARADISE (1932) will be shown. ...The month wraps up on the 31st with several great movies, including Cary Grant and Jean Arthur in ONLY ANGELS HAVE WINGS (1939), Deborah Kerr in Powell and Pressburger's BLACK NARCISSUS (1947), and ALL ABOUT EVE (1950), a movie that is just about perfect in every way. The March Star of the Month is Jean Harlow, with her films being shown beginning on March 8th. I'll be taking a look at the Harlow movies airing in March in about a week. The above is only the tip of the iceberg as far as all the good things being shown on TCM in March. For additional ideas, visit Ivan's detailed post at Thrilling Days of Yesteryear, or consult the full schedule. 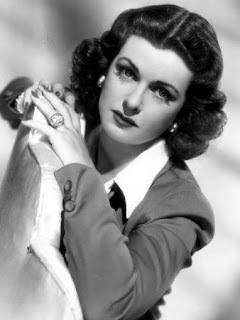 Beautiful Joan Bennett was born 101 years ago today, on February 27, 1910. 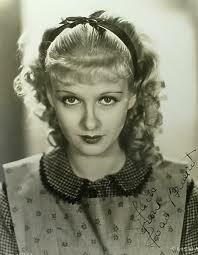 Joan Bennett was born into an acting family which included a famous older sister, Constance Bennett. Joan's career, which began in earnest in the pre-Code era, was divided into several distinct chapters. In the '30s, she was the blonde star of a variety of films, perhaps most notably appearing as Amy in LITTLE WOMEN (1933). 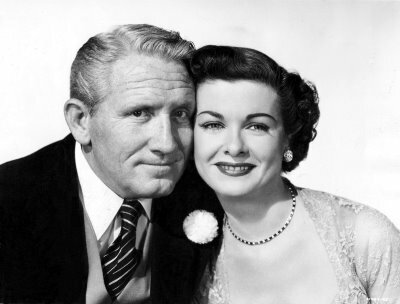 She also starred with Spencer Tracy in ME AND MY GAL (1932), Bing Crosby in MISSISSIPPI (1935), Fred MacMurray in 13 HOURS BY AIR (1936), Cary Grant in the light comedies WEDDING PRESENT (1936) and BIG BROWN EYES (1936), and Randolph Scott in THE TEXANS (1938). As a brunette she appeared in adventure films such as THE MAN IN THE IRON MASK (1939) and the very entertaining GREEN HELL (1940). THE HOUSE ACROSS THE BAY (1940) was another notable early role as a brunette. She played British women twice in 1941, in CONFIRM OR DENY (1941) and MAN HUNT (1941). With MAN HUNT Bennett began a collaboration with director Fritz Lang which also produced THE WOMAN IN THE WINDOW (1944), SCARLET STREET (1945), and SECRET BEYOND THE DOOR (1947). 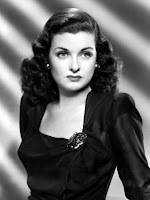 Bennett's appearances as the femme fatale in THE WOMAN IN THE WINDOW and SCARLET STREET are among the most memorable and highly regarded roles of her long career. Bennett was also superb in THE MACOMBER AFFAIR (1947) and THE RECKLESS MOMENT (1949). In THE MACOMBER AFFAIR Bennett didn't hesitate to play a somewhat unpleasant woman who is revealed to have an unhappy marriage while on a safari. In THE RECKLESS MOMENT, directed by Max Ophuls, Bennett's ordinary Balboa Island housewife is swept into intrigue when she tries to protect her teenage daughter, who caused an accidental death. Both films rank among her finest portrayals. Sean Axmaker has written a very good piece on THE RECKLESS MOMENT, calling it a "masterpiece of middle class America." Unlike some actresses of her era, Bennett didn't shy away from playing the mother of teenagers as she neared 40. 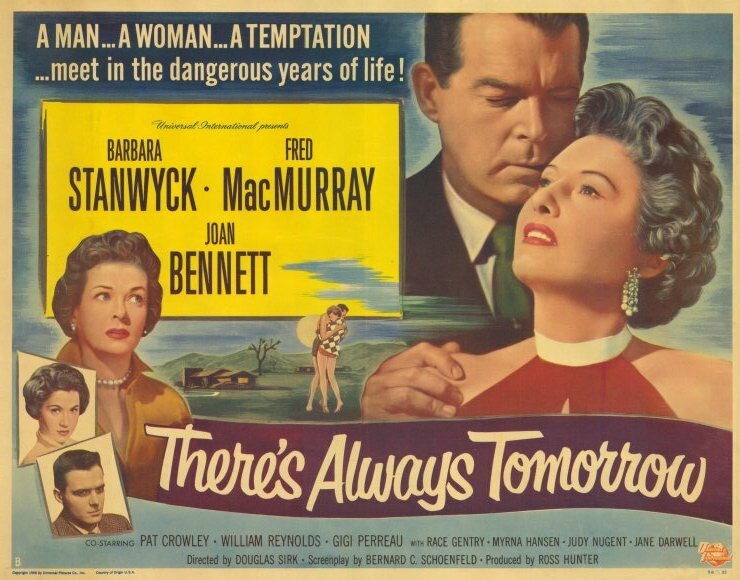 THE RECKLESS MOMENT and FATHER OF THE BRIDE (1950) began the next stage of her career, playing mother roles; FATHER'S LITTLE DIVIDEND (1951) and THERE'S ALWAYS TOMORROW (1956) are further examples. Bennett also worked in television throughout the '50s, and in the '60s she began yet another phase of her career, appearing in the TV cult favorite DARK SHADOWS. Her last acting role was appearing with Tom Selleck and Jane Curtin in the TV-movie DIVORCE WARS: A LOVE STORY (1982). Joan Bennett passed away in 1990, leaving behind over half a century of excellent performances which continue to impress and be enjoyed today. 2013 Update: Here are links to additional reviews of Joan Bennett movies: THE MAN I MARRIED (1940), HIGHWAY DRAGNET (1954) (also here), and SECRET BEYOND THE DOOR (1947). 2014 Update: Here's a review of HOLLOW TRIUMPH (1948). 2015 Update: I recently reviewed GIRL TROUBLE (1942). 2016 Update: Here are reviews of THE TRIAL OF VIVIENNE WARE (1932), SCARLET STREET (1945), BULLDOG DRUMMOND (1929), and FATHER OF THE BRIDE (1950). Additional 2016 Update: I've paid tribute to Bennett in an article for ClassicFlix. 2019 Update: Here are reviews of I MET MY LOVE AGAIN (1938) and TWIN BEDS (1942). ...This weekend's Oscar ceremony is discarding most montages, and (thank goodness) getting rid of those verrry long, often smarmy individual tributes to the acting nominees by other actors. However, the montage of filmmakers who have died in the previous year will still take place. It won't include those who died in February, so no tribute to Betty Garrett. And let's hope there's not a fiasco this year like confusing Jean Simmons and Jennifer Jones. 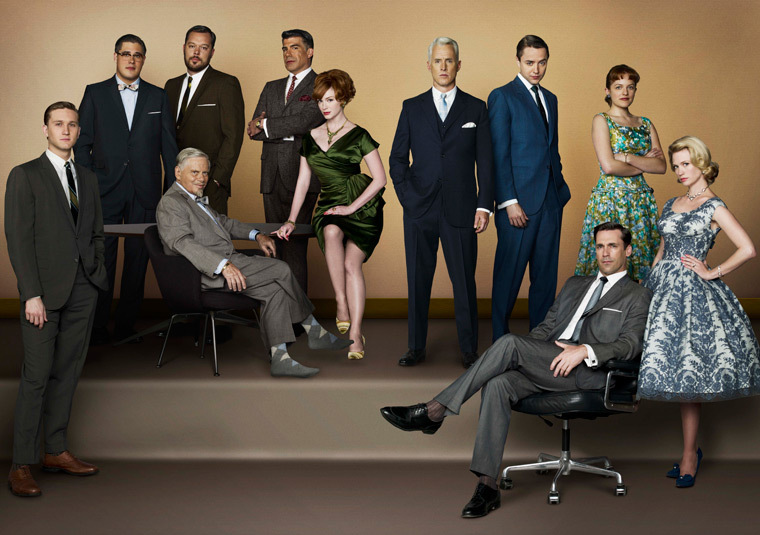 ...My daughter sent me an amusing Infographic explaining the relationships of all the characters on MAD MEN. ...Speaking of children's literature, Maud Hart Lovelace's BETSY-TACY is now available for the Amazon Kindle. ..."The Wisconsin Protests and the New Medical Ethics": Read it and ponder the future. And worry. 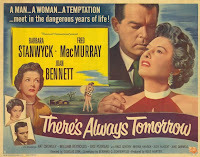 ...Happy Thoughts, Darling takes a close look at THERE'S ALWAYS TOMORROW (1956) starring Fred MacMurray, Barbara Stanwyck, and Joan Bennett. I'm looking forward to seeing this one. ...Check out the beautiful photos at Jim Lane's Cinedrome, including a color post on PRINCE VALIANT (1954). ...Southern Californians may want to visit the Samuel French Bookshop on Sunset Boulevard in Hollywood, featured in a story yesterday in the L.A. Times. ...Last week Lou Lumenick of the New York Post looked at a number of recent releases, including SWEET SMELL OF SUCCESS (1957) and MURDER, HE SAYS (1945)...over at the New York Times, Dave Kehr shared thoughts on Warren William and some recent Warner Archive releases. 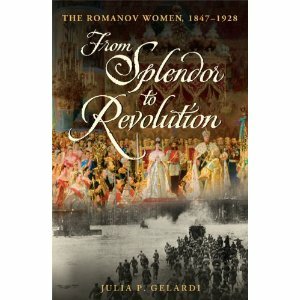 ...On my reading wish list: FROM SPLENDOR TO REVOLUTION: THE ROMANOV WOMEN, 1847-1928 by Julia P. Gelardi. It received a starred review in Publishers Weekly. ...Royal News Watch: Catherine Middleton looked every inch a princess last week as she carried out her first official royal engagement, christening a lifeboat...Catherine Zeta-Jones was presented with a CBE by Prince Charles...and there are darling official photos of the little twins born last month to Crown Prince Frederik and Crown Princess Mary of Denmark. ...In California there's talk of a possible tax on sodas and other drinks, in order to "fight obesity." It's a shame that the concept of personal freedom completely eludes those who make such proposals...and what's next after the sodas? Where will this sort of control freak taxation ultimately end? Do we really want the State acting as our Mommy and Daddy? I can't help but think that the Founding Fathers would be incredulous. ...Mike Clark of Home Media Magazine reviewed BODYGUARD (1948), recently released by the Warner Archive. 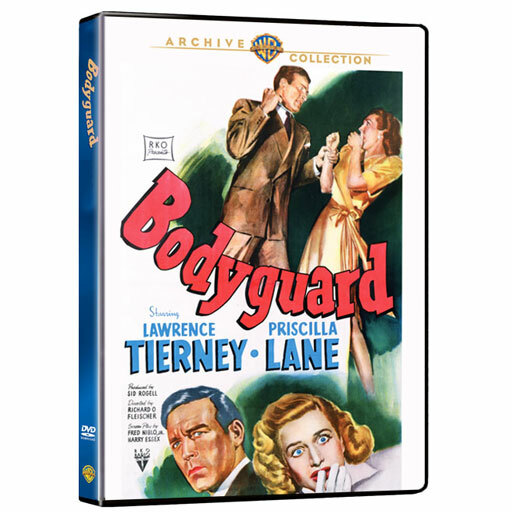 It stars Lawrence Tierney and Priscilla Lane. ...My kids get a kick out of the suddenly ubiquitous Angry Birds game...there's video of a rather clever, fully functional Angry Birds birthday cake. ...Here's a Discovery News story on the relationships between cats and their humans. ...Ending with a feel-good story: "New Zealand Quake Survivor Marries Fiance Who Helped Save Her." 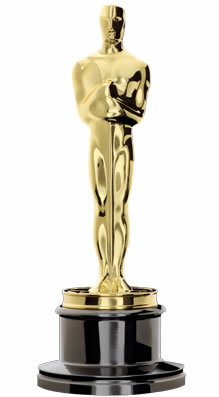 Happy Academy Awards Day, and have a great week! Just a few days ago there was some discussion here about Netflix and the lack of closed captioning for streaming. As a follow-up to that, I have positive news to share. On Thursday Netflix announced that 30% of their streaming titles are now closed captioned. Although that captioning is currently supported by just a few players, including the Wii, later this year Netflix anticipates the captioning will also be available on additional devices, including the Roku and Xbox 360. Netflix also shared the very encouraging news that by the end of 2011 they anticipate having completed captioning for 80% of their streaming library. They've also added a page at their website listing all the movies and TV shows currently available with subtitles. As streaming evolves, Netflix is moving quickly to meet the needs of many consumers, which I think is emblematic of their overall ability to stay ahead of evolving technology thus far. In other Netflix news, last week Netflix made a huge two-year deal to stream programs in the CBS library. What's curious to me is that some of the programs I've read are part of the deal, such as FRASIER and CHEERS, were originally NBC shows. ...The big news out of Disneyland yesterday was the announcement of three important premiere dates. Mickey's Soundsational Parade debuts on May 27th, Memorial Day weekend. Disneyland's rebooted Star Tours ride and Ariel's Undersea Adventure at California Adventure both open on June 3rd. Perhaps Disney is hoping to be able to divide and conquer the crowds? ...I was glad to hear that King Triton, who vacated Disneyland when Pixie Hollow moved in, is going to be part of the building decor at Ariel's Undersea Adventure. ...Jim Korkis remembers the late Bill Justice at MousePlanet. ...California Adventure has a new -- very busy! -- logo. ...Disney Parks and Resorts Chairman Tom Staggs recently gave a report at an investor conference. MousePlanet analyzes some of his remarks and what they could mean for the future. ...There's a nice selection of Disneyland and California Adventure photos at MiceChat's In the Parks, and the Disney Food Blog also has a good story on Disneyland's Family Fun Weekend celebrating Mardi Gras. I hope to head out to Disneyland for the Mardi Gras celebration next weekend. ...The amazing castle at Disneyland Paris is being rehabbed; more photos here. ...We have several fun Disney events ahead. Besides THE ABSENT-MINDED PROFESSOR (1961) screening next month at the Disney Studios lot, we also have tickets to D23's 2nd Anniversary gathering next month, featuring the World of Color show, and we're signed up for April's MouseAdventure. The MouseAdventure Basic and Advanced divisions sold out within just a few hours of going on sale. 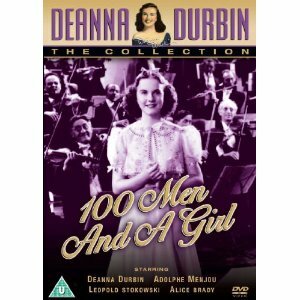 Deanna Durbin's ONE HUNDRED MEN AND A GIRL is filled with beautiful music from the impressive opening credits, featuring Leopold Stokowski conducting a symphony orchestra, to the final strains of Durbin singing an excerpt from "La Traviata" as the film draws to a close. The movie is a great example of the films produced by Joseph Pasternak and directed by Henry Koster, which exposed audiences of the '30s and '40s to memorable music, smoothly served by appealing personalities with plenty of comedy on the side. This was Deanna's second big hit, the first being THREE SMART GIRLS (1936). It's quite remarkable that someone who had such little experience at that point in her career was such an assured performer. Deanna was just 15 years old when she made ONE HUNDRED MEN AND A GIRL. She handles both comedy and tears with ease, and of course she had an incomparable singing voice. The Depression-era tale concerns a group of unemployed musicians, including Deanna's father (Adolphe Menjou). 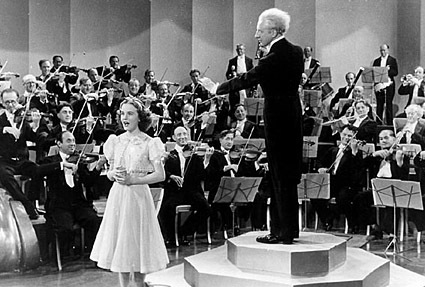 The long and the short of it is that it's suggested that the musicians form their own orchestra, and Deanna is determined that none other than the great Stokowski will conduct the orchestra's first concert, providing badly needed publicity. Obtaining financial support and Stowkowski's interest both prove to be far more challenging than initially expected. It's not my favorite Durbin plot, as the Depression storyline tugs at the heartstrings for a prolonged time, but the somewhat Capra-esque plot has a rich emotional payoff. There's a moment near the end when there's a fantastic pullback shot as Stowkowski surveys the orchestra that's simply marvelous; to say more would spoil it. And of course, there's the music, and lots of it! It's fun to note that half the cast of MY MAN GODFREY (1936) appears in the film; Mischa Auer plays a musician, while Eugene Pallette and Alice Brady are once again a pair of wacky, wealthy marrieds. Pallette and Brady's mansion is an Art Deco marvel. Speaking of sets, I believe the theater set seen throughout the film was built for the silent THE PHANTOM OF THE OPERA (1925); it was reused many times over the decades, including for the 1943 PHANTOM remake. IMDb indicates that all three movies were filmed at Stage 28 at Universal Studios. The cast includes Frank Jenks in a nice bit as a gruffly supportive cabbie. Billy Gilbert, Alma Kruger, and Charles Coleman are also in the cast. Perennial bit player Bess Flowers is prominently featured in a party scene. Leonid Kinskey, best known for CASABLANCA (1942), has a small role as a pianist accompanying Deanna at the same party. My favorite musical piece was Deanna singing Mozart's "Alleluja," accompanied by Stowkoski and the orchestra. Her other songs include "A Heart That's Free" and "It's Raining Sunbeams." 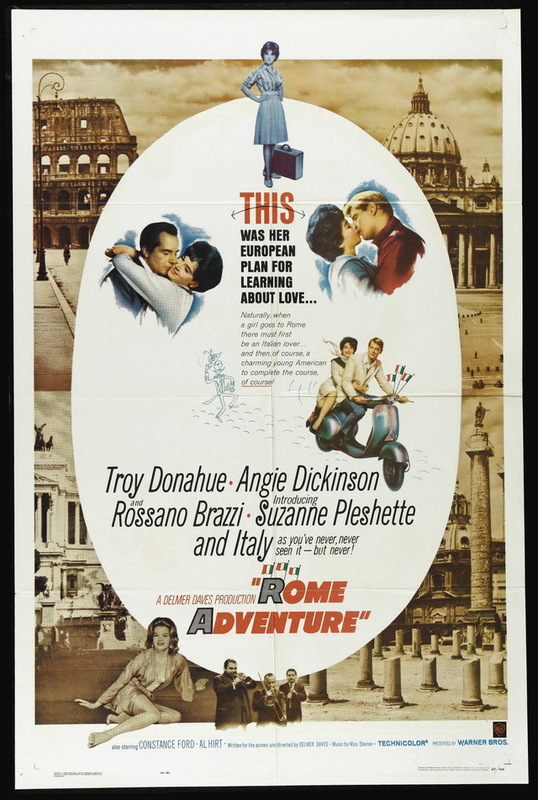 The movie was shot in black and white and runs 84 minutes. ONE HUNDRED MEN AND A GIRL was nominated for Academy Awards for Best Picture, Original Story, Sound Recording, and Film Editing. It won the Oscar for Best Musical Score. 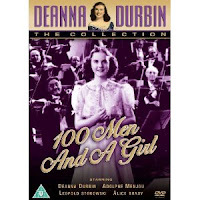 ONE HUNDRED MEN AND A GIRL has not had a DVD release in the United States. Hopefully that will be rectified before too long! It has been released in Europe on a Region 2 DVD. It's also had a VHS release; the MCA/Universal video I watched was a fine print. I only have five Durbin films left to see out of her 22 movies, a total which includes the short EVERY SUNDAY (1936), which costarred Judy Garland. Still ahead for me to see for the first time are SPRING PARADE (1940), CHRISTMAS HOLIDAY (1944), I'LL BE YOURS (1947), SOMETHING IN THE WIND (1947), and UP IN CENTRAL PARK (1948). Links for reviews of all the Durbin films I've seen to date can be found in the birthday tribute I posted last December. 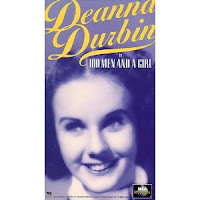 Deanna Durbin was one of the great talents of the movies who is not especially well known today, although she certainly has devoted fans among the classic film blogging community. For those who've never seen a Durbin film, how about adding IT STARTED WITH EVE (1941) to the Netflix queue? It's a wonderful comedy, costarring Charles Laughton and Robert Cummings, and the perfect introduction to Deanna Durbin. 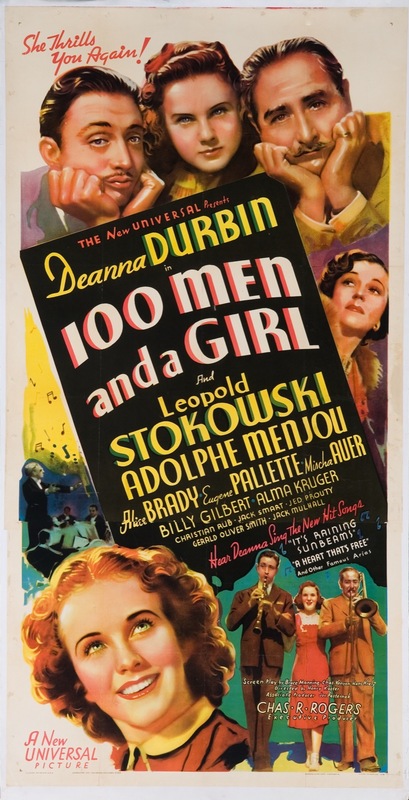 November 2015 Update: ONE HUNDRED MEN AND A GIRL is now available on DVD in the Universal Vault Series. A heads up for my fellow classic film fans: the Warner Archive is having a pretty good sale this weekend, with a buy two, get one free deal. That takes the price per DVD to about $13.33. There's also free shipping. The sale runs through February 28th. ...Glenn Erickson reviewed PRINCESS O'ROURKE (1943) in his DVD Savant column. Erickson writes of writer-director Norman Krasna's movie: "Krasna scores on several levels of comedy and romantic feeling... Princess O'Rourke is a gem of an Olivia de Havilland picture, and one of leading man Robert Cummings's best -- the New York Times reviewer thought Cummings was a new James Stewart in the making." Erickson goes on to say it's "a classic screenplay in every sense" and "The restaurant-dance club scene is a beauty," giving the picture a big thumbs up. As for the print, it's "an unrestored but acceptable transfer." My review of PRINCESS O'ROURKE is here. Highly recommended. ...SUNDAY IN NEW YORK (1963) also had a Norman Krasna screenplay. It was recently reviewed by Jack Goodstein, Mike McGranaghan, and Joe Meyers. The consensus is that the newly remastered widescreen print looks great. My review is here. I'm looking forward to the chance to see this DVD since the print I previously reviewed was a pan and scan copy. ...Mike Clark reviewed the late Anne Francis in a remastered widescreen print of GIRL OF THE NIGHT (1961). In Laura Wagner's excellent profile of Francis in FILMS OF THE GOLDEN AGE (No. 55, Winter 2008-09), she says that though the film was "little appreciated or seen at the time," it was Anne Francis's favorite of all her performances. Francis said, "GIRL OF THE NIGHT is special to me because it was such a demanding role. It really was a tour de force..." Wagner's biography of Francis is due in late May. ...Mike Clark also reviewed THE RELUCTANT DEBUTANTE (1958), saying "it's handsomely remastered." THE RELUCANT DEBUTANTE is one of several recent releases which were directed by Vincente Minnelli. For information on the most recent Archive releases, please visit my post of last Saturday. There's also lots of info on new titles of the last few months in posts of December 5th, January 17th, and February 10th. Update: I always have the world's worst time getting logged in with my password at the Archive. I don't have this problem at any other shopping site... What gives? It usually accepts it on about the third try. Also, apparently the sale is not good for the latest releases. Although the fine print simply says it excludes value packs and pre-orders -- with the brand-new releases displayed immediately underneath said fine print -- the sale price did not pop up when I tried to place an order including STARS IN MY CROWN and AMBUSH. When you click the "Shop Sale" button, a list of titles comes up without the most recent releases. The existence of sale restrictions beyond value packs and pre-orders really should be clarified front and center on the website...I wanted to order February 22nd releases, which don't constitute pre-orders. A disappointment. The entire Wilkins clan of DEAR RUTH (1947) returns for more fun in DEAR WIFE (1949). This time around, Judge Wilkins (Edward Arnold) is running against his son-in-law Bill (William Holden) for New York State Senate, thanks to the machinations of the judge's irrepressible teenage daughter, Miriam (Mona Freeman). Joan Caulfield is back as Bill's wife Ruth, with Mary Philips (Mrs. Wilkins), Billy DeWolfe (Albert), and Marietta Canty (Dora, the cook) also reprising their roles from the earlier movie. 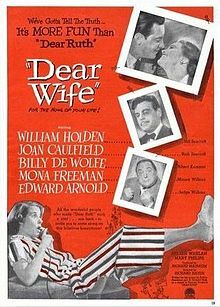 DEAR WIFE perhaps isn't on the same level as DEAR RUTH, which had a very sharp script by Arthur Sheekman, based on Norman Krasna's play. It's nonetheless entertaining and has some good lines, supplied this time around by Sheekman and N. Richard Nash. The plot may sound far-fetched, but nothing's impossible where Miriam's concerned -- after all, it was her ghostwritten letters which landed Bill as Ruth's husband in the first movie! She's still as politically conscious and harebrained as ever, played with peculiar charm by Mona Freeman. Freeman would reprise the role one more time in DEAR BRAT (1951), with Arnold, Philips, and DeWolfe also returning, as well as Patty Lou Arden as Miriam's friend Clara. Holden and Caulfield are charming as the young marrieds, with Arnold and Philips quite amusing as Ruth and Miriam's parents. It's most enjoyable spending time with the Wilkins family in their lovely home. The movie was directed by actor Richard Haydn, who has a cameo in the final scene. 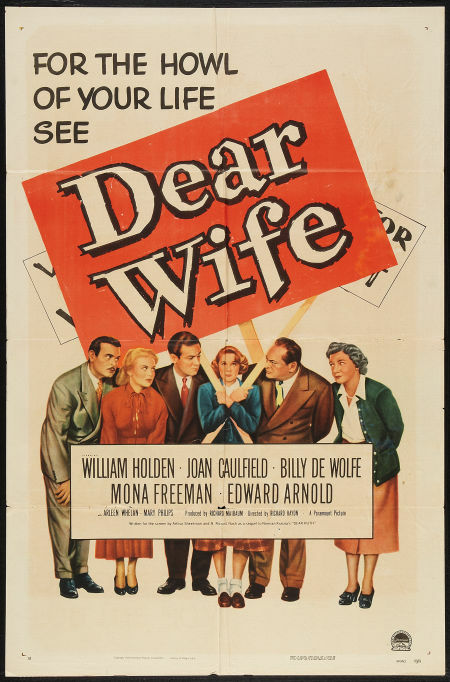 DEAR WIFE was one of three movies Haydn directed, the others being MISS TATLOCK'S MILLIONS (1948), starring John Lund and Wanda Hendrix, and MR. MUSIC (1950), with Bing Crosby and Nancy Olson. Haydn also had roles in the other two films he directed. The movie runs 88 minutes. DEAR WIFE is available on Netflix's Watch Instantly service, along with the final film in the trilogy, DEAR BRAT. Curiously, DEAR RUTH isn't listed at Netflix. None of the films in the trilogy have been released on DVD, but DEAR RUTH and DEAR WIFE have been released on VHS. DEAR WIFE, like DEAR RUTH, is a well-crafted movie made to order for those seeking lighthearted family entertainment. 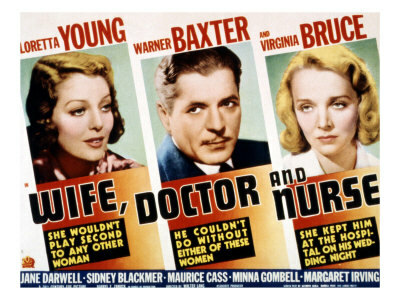 Two years before starring in WIFE, HUSBAND AND FRIEND (1939), Loretta Young and Warner Baxter appeared in WIFE, DOCTOR AND NURSE (1937). However, the two films have nothing in common other than the same lead actors and similar titles. 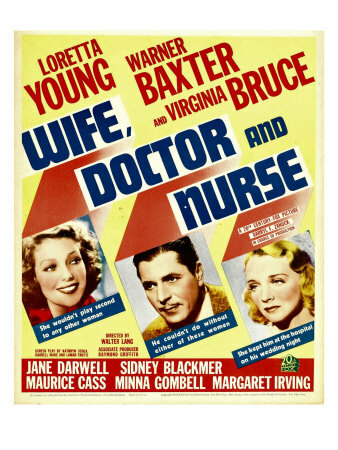 WIFE, DOCTOR AND NURSE is a predictable but entertaining tale of a young Park Avenue miss (Young) who marries her doctor (Baxter), only to feel her marriage is threatened by the doctor's ultra-loyal nurse, improbably named "Steve" (Virginia Bruce). There are countless scenes where the doctor answers a ringing phone only to learn he must leave his wife -- again -- in order to return to Victory Hospital. (Love the name!) The wife's a good sport about it all, even though the doctor and Steve forget all about her when work calls, until she learns Steve loves the doctor too. The doctor loves his beautiful young wife, but can't function without Steve by his side. What to do? How the characters work it out is a bit absurd, given what's gone before. The finale reminded me of the strangely uncertain ending of TOO MANY HUSBANDS (1940). I also had to chuckle at the idea the women could sober up the completely "smashed" doctor well enough he could perform surgery within a short period of time. Apparently they didn't worry much about malpractice suits in the '30s, at least in the movies! The cast do what they can with the light material. 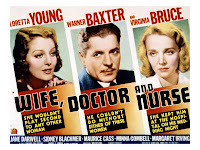 Baxter was considerably older than his leading lady, but the effervescent Young makes the viewer believe that she's head over heels for the doctor. 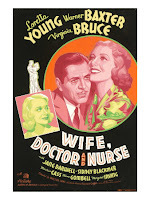 Bruce does a good job in her role as a nurse who inappropriately crosses boundaries with her employer. It's a movie that's nothing particularly special and is occasionally annoying or improbable -- and yet, I have to say I rather enjoyed it. I like Young, in particular, and it was interesting to observe the film's takes, for good or ill, on marital and business relationships. The film is interesting both as a relic of its time -- including adjoining bedrooms for the doctor and his bride, rather than adjoining beds -- and also as an example of how the movies saw women's roles in a man's life. The film would make a great double bill paired with WIFE VS. SECRETARY (1936), which starred Clark Gable, Myrna Loy, and Jean Harlow -- who, like "Steve," was a valued employee with an unfeminine name, "Whitey." One could write an entire essay on the meanings behind that angle alone! WIFE VS. SECRETARY next airs on Turner Classic Movies on March 22, 2011. The supporting cast includes Jane Darwell, Elisha Cook Jr., Sidney Blackmer, and Minna Gombell. Alert viewers will spot Lynn Bari with a couple of lines as a party guest. June Gale, who later married Oscar Levant, plays a nurse. One of the film's strong points is the dazzling hospital set, with large, airy rooms and sleek lines, such as displayed in the lobby window's design. I watched a fairly poor copy and would really love to see this one in a beautiful print in order to better enjoy the set. (Art direction was by David S. Hall, with set decoration by Thomas Little.) The hospital in INTERNES CAN'T TAKE MONEY (1937) was also gorgeous; apparently 1937 was a good year for movie hospitals! 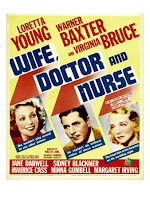 WIFE, DOCTOR AND NURSE was directed by Walter Lang. Kathryn Scola, who cowrote the screenplay with Lamar Trotti, wrote last weekend's movie, THE CONSTANT NYMPH (1943). 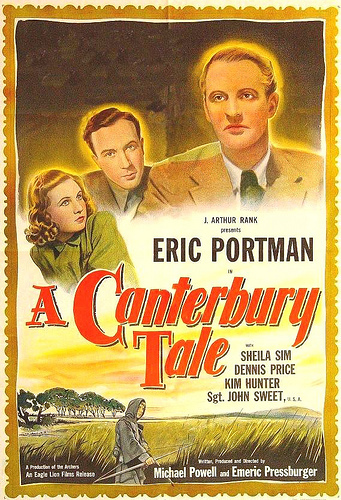 The movie was filmed in black and white by Edward Cronjager. The costumes were designed by Gwen Wakeling. The movie is 85 minutes long. WIFE, DOCTOR AND NURSE was released by 20th Century-Fox, so it may show up in the future on Fox Movie Channel. Amazon's new video streaming service, which I previewed on February 2nd, launched today. Paid subscribers to Amazon Prime 2-day shipping service will now also receive access to unlimited, commercial-free streaming of 5,000 movies and TV shows. Amazon's offerings will include "older movies" from the Sony and Warner Bros. libraries. Hmmm, could this mean that DVD-R titles from the Warner Archive or Sony's Columbia Classics might show up on Amazon? To my knowledge, none of those titles are available at Netflix. Amazon's 5000 titles represent just 25% of the content available on Netflix, but Amazon says it's "just getting started" and will be looking to "grow the selection." 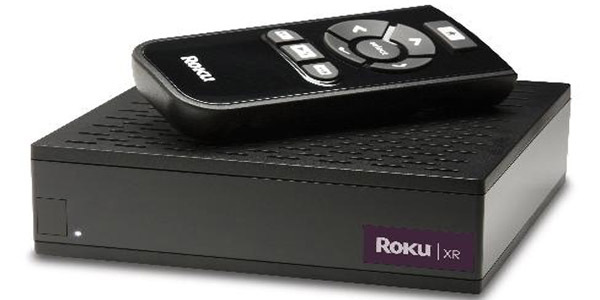 Amazon streaming can be watched using a large number of streaming devices, including the Roku, which I briefly reviewed earlier this month. Those who receive Amazon Prime for free, such as college students, aren't eligible for the free streaming. It's reported Amazon won't be raising the Amazon Prime subscription fee any time soon. It's $79 a year, which breaks down to $6.58 a month for two-day shipping plus access to streaming. My daughter wasn't particularly impressed with the TV listings; for instance, most of the British shows listed are also available on Netflix or Hulu. 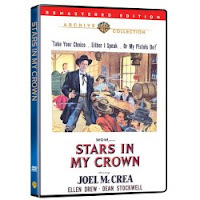 The older films available on Amazon Instant include a mix of classics, public domain movies, "B" films and lots of Roy Rogers titles. 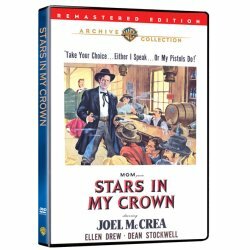 Some of the movie titles available on Amazon which aren't available on Netflix Watch Instantly include Douglas Fairbanks Sr.'s ROBIN HOOD, Alan Ladd's THE PROUD REBEL, Hitchcock's SUSPICION, MGM's LITTLE WOMEN (1949), Anna Neagle and George Sanders in NURSE EDITH CAVELL, Neagle in SALESLADY, Randolph Scott in ABILENE TOWN, Yvonne DeCarlo in SALOME, WHERE SHE DANCED, Ginger Rogers in THE GROOM WORE SPURS, Warren William and Gail Patrick in WIVES UNDER SUSPICION, and Sally Forrest in NOT WANTED. Those looking for more mainstream classic movie titles in significant numbers may be disappointed by the initial listings, but it looks like there should be some excellent treasure hunting opportunities for film fans such as myself who love exploring relatively obscure titles and B movies. I need to delve more deeply, but it doesn't appear at a glance that Amazon has the ability to create an Instant queue; for now I put a couple of titles on my "Wish List." Hopefully that service will be coming. I'll be watching for additional information on this new service and reporting developments here. Update: I had the chance to look at the service on my TV while eating lunch today. There is definitely no queue at present; that's something that needs to be added for viewers' convenience. Additionally, at least on Day One, not all the available titles can be found by searching on the alphabetical keypad. While I found SUSPICION, I didn't find SALOME, WHERE SHE DANCED or NOT WANTED, though these titles could be found by laboriously scrolling through the posters of titles. I anticipate that given time Amazon will be offering improvements in these areas. 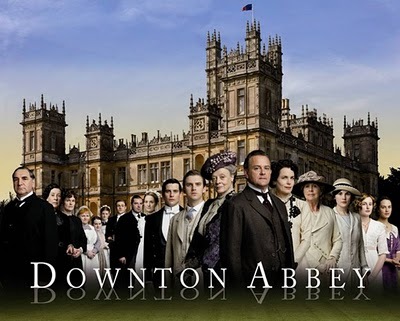 I'm now more than halfway through watching Season 1 of DOWNTON ABBEY on Netflix, and I'm thoroughly enjoying it. 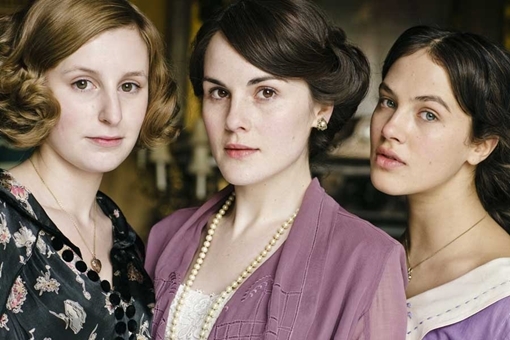 The show appears to have been strongly inspired by UPSTAIRS, DOWNSTAIRS, but with a lighter touch -- more Austen (or even Miss Read) than, say, Dickens. 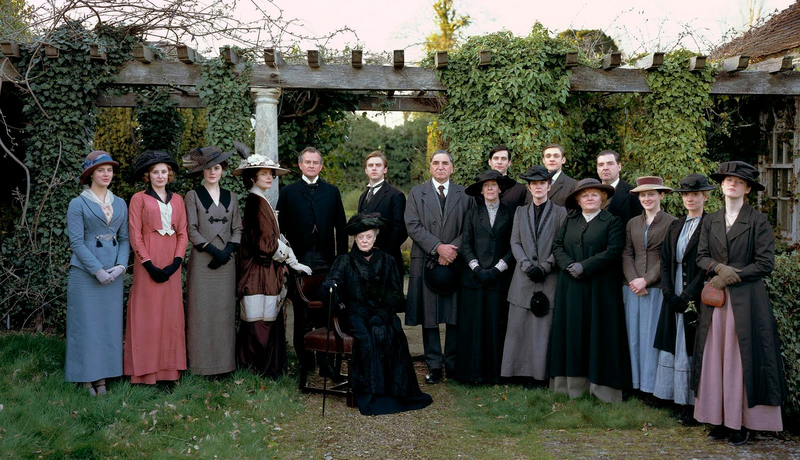 Of course, any show about the British nobility and their servants will have to have certain types of characters; for instance, the qualities that would allow a man to rise through the ranks to butler would seem to be universal, and historical incidents of a certain time frame must also be addressed. Nonetheless, some of the similarities between the two programs are notable to fans of the '70s series. Both shows feature a Thomas and a Daisy below stairs; nasty Thomas calls to mind both Alfred and Thomas of the earlier show, while scullery drudge Daisy reminds the viewer of Eaton Place's not-too-bright Ruby. Both shows feature a smart young miss as the head parlor maid, Jean Marsh's Rose in the original and Joanne Froggatt's Anna at DOWNTON ABBEY. Jessica Brown-Findlay's progressive Sybil makes me think of Lesley-Anne Down's Georgina. And of course, each show features an unflappable butler equal to any crisis. (I love a play on the British WWII poster "KEEP CALM AND CARRY ON" which says "KEEP CALM AND WAIT FOR CARSON." Delightful!) 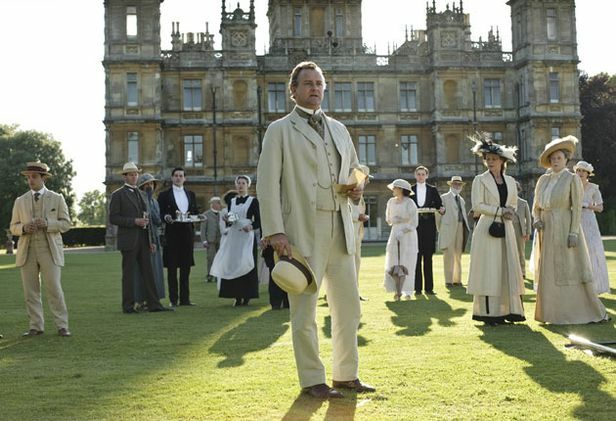 Both shows lose characters to the Titanic; in the case of Downton Abbey's lost heirs, they're never actually seen, but their death sets in motion the most important aspects of the plot. 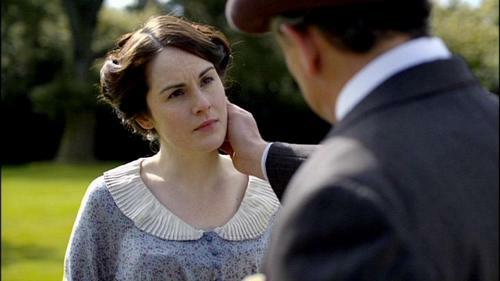 I do have a quibble or two with the series, the biggest being that I found it unbelievable that Lady Mary wouldn't immediately extricate herself from what we might term "the Turk situation," trying not to be too spoilerish for those who haven't yet enjoyed the show. 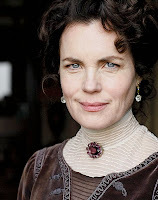 Lady Mary has shown herself time and again to be a flinty young miss, and given the mores of the era and all that she had at stake in terms of her future, her behavior simply didn't make sense to me. For a moment it felt as though DALLAS had invaded the Abbey -- and then the viewer was immediately distracted by the, er, very unexpected plot development that followed. The elliptical storytelling here was a bit frustrating, leaving the viewer in the dark about key plot points. Otherwise the show is quite charming. As I mentioned in comments shortly after I began watching, I like the fact that for the most part the characters are nice people, with human frailties and foibles. Much of the conflict arises simply from the situations in which they find themselves, whether it's being the unexpected heir to a great estate or an elder daughter who feels both displaced and without purpose. Of course, there are two downstairs characters who are truly evil, but I suppose they have to be part of the story in order to provide some of the conflict. I'm hard-pressed to say who I enjoy most among the large cast, but Hugh Bonneville (Bernie from NOTTING HILL) as the kindly, ethical Earl of Grantham is near the top of my list. Although some viewers apparently didn't care for her, I find Elizabeth McGovern interesting as the Earl's wealthy American wife, Cora. I love that the show depicted a very common occurrence of the era, the uniting of American money with impoverished British nobility, and I also like that the Earl and Countess truly love one another. How refreshing! Below stairs, how can one not love dedicated Carson, the butler (Jim Carter)? 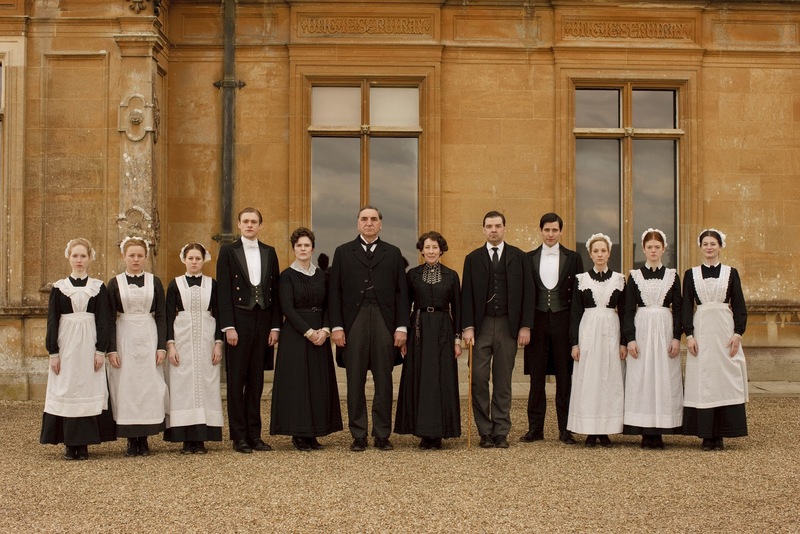 Or brave Mr. Bates (Brendan Coyle), the valet with a limp and a sweet smile reserved for parlor maid Anna? And Phyllis Logan is splendid as the firm but fair head housekeeper, Mrs. Hughes. I also especially like Penelope Wilton as sensible Mrs. Crawley, who suddenly finds her son Matthew (Dan Stevens) the heir to Downton Abbey. Maggie Smith is delightful as the Dowager Countess, whether she's moaning about the dangers of electricity or trying to stay upright on a swivel chair ("I'm a good sailor!"). Parental advisory: much of the series is absolutely fine for all ages, but unfortunately there are also a couple scenes and minor plot threads which are definitely not family friendly. I would therefore not recommend it for children younger than mid to late teens. Big news for Season 2: IMDb lists Angela Lansbury in the cast, playing a character named Lady Elizabeth Crawley. I've been Googling looking for more information on her casting, but haven't found anything yet! Other new cast members will include Maria Doyle Kennedy, who played Catherine of Aragon in THE TUDORS, and Iain Glen. Those who haven't yet watched the show might want to sample this tribute video or watch a trailer for a peek at what it's all about. Both videos do a good job of introducing themes and characters without disclosing too much. 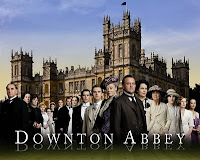 All in all, DOWNTON ABBEY is richly detailed viewing which is very much worth watching. Highly recommended.